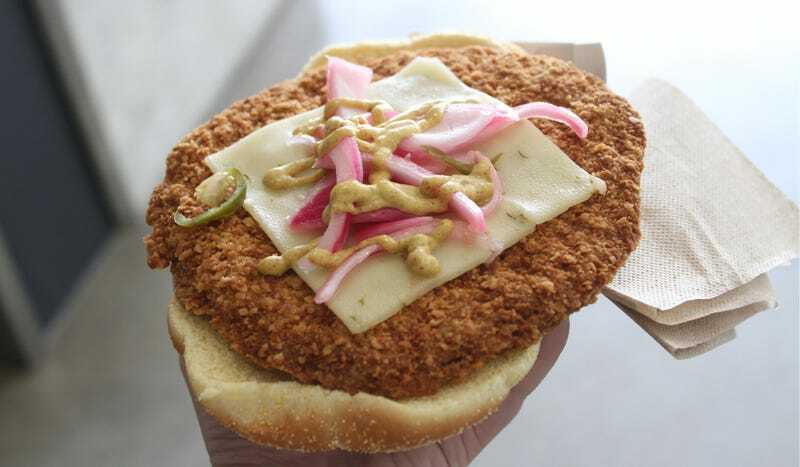 Back when I asked what you wanted to see from this year’s Indianapolis 500, one of you suggested “the strangest food you can find.” Problem is, Indiana is so middle-America that it’s geographically in the middle of America, so a deep-fried pork tenderloin on a bun is about as weird as it gets. Burgers. Sausages. Fries. Big turkey legs. Everywhere you go at Indianapolis Motor Speedway, you’ll much of the same stadium food you’ll find across the country. In other words, there weren’t any particularly exotic food stands. There was one additional, less familiar listing on most stands: “tenderloin.” My friend who used to work for one of the local Indianapolis TV stations also recommended the tenderloin, so I figured why not? It must be some kind of local delicacy. It’s perhaps the perfect foodstuff to represent where we were staying and how we had to get to the track every day. We got stuck in Bloomington because we waited too long to book a hotel, and it reminded me of Pennsyltucky without the charm. The roads were rutted, like thar be buggies, but the road in to IMS was as dull as it got, lacking the gentle, flowing curves of Regular Car Reviews country. Four lanes, under construction, limited to 45 mph despite the crews having packed it in for the day. These roads put me to sleep whenever I wasn’t trying to crank out work on the wifi connection in Kurt’s Cadillac ATS-V, and were excruciatingly dull to drive when I had to take my hopelessly uncomfortable rental Rogue back to fly out of Indianapolis. This part of Indiana was unmistakably American, full of rusty trucks and rolling farm land, but perhaps in its least exciting way—not unlike American cheese or a Pontiac G6. Of course its most famous racing venue would be represented to the foodie world by something deep-fried on a bun. So, I found a break on Legends Day and stood in line for a tenderloin sandwich. It wasn’t exactly cheap—around $9 for just the sandwich, if I remember correctly—but you’re a bit of a captive audience here. At the heart of the sandwich is a pork tenderloin that’s been hammered flat like a chicken fried steak or a wienerschnitzel, then deep fried to a golden brown. This was a relatively small version with a thinner tenderloin than some of the non-race-track versions, but the tenderloin itself still stuck out around the bun. Crowning the big, wide piece of meat was a slice of pepper jack cheese, pickled giardiniera vegetables and a few squirts of dijon mustard. It was served open-faced for you to assemble between two soft, yellow-hued buns. Normally, the tenderloin sandwich also comes with bacon, but I am the one (okay, maybe the second) person on the Internet who doesn’t get super enthusiastic about bacon über alles. Don’t give me that look; that’s more for you. Deep-fried tenderloin is salty and porky in its own right, and adding bacon on top of that just sounded unappetizing on a muggy day. For bacon fans who revel in pork overkill, the sandwich as-is is probably your jam. Like any fine racing machine at IMS, my sandwich also needed to be well-lubricated. That meant tracking down mayonnaise. Sure, the sandwich comes with dijon mustard, but the few squirts of dijon in the middle weren’t enough, and they also weren’t mayonnaise. Unfortunately, the condiment station outside the food stand had no mayo. I guess I should have asked for the greatest condiment ever made with my order, but luckily, I was able to acquire a spare packet in the media room. Operation: Stef Eats A Sandwich was a go. The first few bites of the sandwich’s outer edge are all tenderloin, however, the best bites were at the very center. The fluffy yellow bun was a perfect match for the crisp tenderloin. The “giardiniera” was primarily pickled onions and jalapeños, which are the best pickled vegetables, anyway. The centermost nibbles that combined cheese, pork, bun, pickled veggies and condiments were all that is right with sandwich. The verdict? The IMS tenderloin is pretty tasty. If you forgot to pack in a lunch at Indy and need a quick, pricey snack, it ain’t bad. Just be prepared to revisit the subject of the tenderloin sandwich in a few hours. It’s track food, therefore, you will emit Volkswagen turbodiesel levels of foul emissions. The upside is that you’re at an event that celebrates with milk, so trust me, you won’t be the only person crop-dusting the speedway. Why Do Drivers Drink Milk At The Indy 500?